PHUKET: Police have reopened one traffic lane on a section of Patak Road where a Phuket tour bus overturned on the Chalong-Kata Hill earlier this morning, killing at least one person. “They are allowing traffic to pass in one direction at a time to ease the tailbacks on the hill,” said one bystander. “Emergency workers are trying to recover the vehicle now. They are trying to lift the power cables high enough in order to avoid cutting them so power can be restored as quickly as possible,” he said. 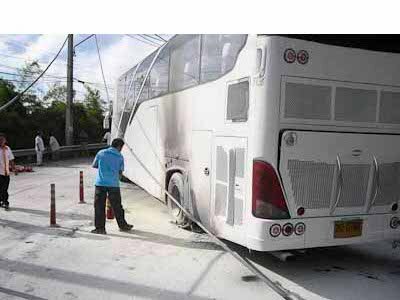 Capt Nitikorn Rawang of the Chalong Police told the Phuket Gazette that the overturned coach, operated by CNR Tour, was heading from Kata to Chalong. Police believe a mechanical failure caused the accident, he said. The injured driver of the bus was among the many people rushed to hospital, he added. The other bus that remains stalled on the hill had a rear tyre explode when one of the downed power cables struck it leaving scorch marks on the wheel arch. None of the passengers on that bus were injured, Capt Nitikorn said.